1. Where did Moses receive the Ten Commandments? 2. When Moses seemed to be delayed coming down from the mountain, what did the Israelites do? a) They gathered for prayer. b) They melted their gold earrings and made a golden calf idol. 3. When God got upset by their disobedience, what did He want to do? a) He wanted to destroy them. b) He wanted to give them harsher commandments. 4. When Moses found the people worshipping their idol, what did he do with the tablets containing the Ten Commandments? a) He threw them to the ground, breaking them into pieces. b) He fastened them to a high pole where all the people could see them. 5. Which tribe proved their loyalty to God? a) The tribe of Levi. b) The tribe of Judah. 6. When the people couldn’t find water and complained to Moses, what did God produce water from? a) A miraculous river in the desert. b) A rock that Moses struck with his rod. 7. God gave Israel a tremendous victory over which enemy army? 8. 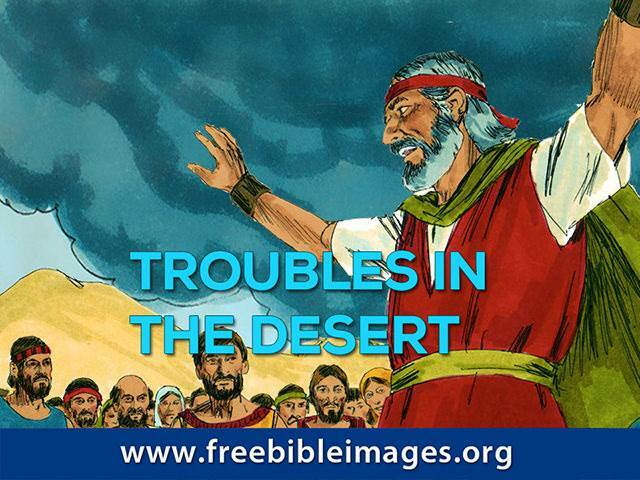 What lesson did God teach the Israelites by sending fiery serpents into their camp? a) That they should only eat kosher food. b) That rebellion is sin and must be punished. 9. What did Moses put up on a pole to save people from the deadly snake bites? a) A fiery serpent of brass. 10. How can we have eternal life? a) By believing in Jesus who was lifted up on the cross. b) By obeying God’s Ten Commandments.